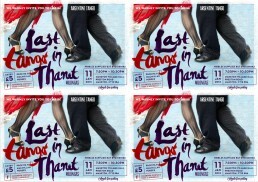 The ‘Last Tango in Thanet’ is the name of a Tango Milonga that was held in Margate, Kent. I was asked to design the flyer to add more flair and to give it it a fresher, more suitable look. There was no particular style to adhere to, so I experimented with hand written calligraphy as I thought the dynamic of the brush strokes added movement and rhythm to the design, tying in with the theme of dance.